Against my best plans, I may have let the blogging/social media slip a bit in June and July. Before the excuses, a quick and very exciting note: I will be vending at the Squam Art Fair on September 15, from 7:30 to 10:00. I am so excited to be included in such an amazing group of vendors! (And I really hope that I’ll be able to pull together a few new kits I’ve been planning in time, which brings me back to the excuses). Unexpected pregnancy induced exhaustion limited my work time this summer and what energy I had often went to baby centric things - baby shower, painting baby things, and the part time job that is meeting all the doctors appointments scheduled as part of a “geriatric pregnancy” (and aside from being “elderly”, both I and the as-yet-unborn-baby are thankfully in perfect health - I cannot imagine how much more medically intense things must become if there are issues). I can now sew fitted sheets and embroider sheets but I still cannot fold fitted sheets. So now I have four home sewn sheets with hand-embroidered whales. A few days ago we discovered that my sister-in-law had also given us several crib sheets, which somehow got mixed in with a box of baby clothes. So the home sewn sheet part was probably completely unnecessary. Still, it was a fun project. Not being able to carry the buckets and pots of water necessary for dyeing has led me to catching up on other projects, most too boring and administrative to bother describing, but amongst the other chores I finally downloaded the photos that have been accruing on my working SSD card, and came across this gem of an outtake from a mid-February photo session. Note my hand settled gently and proudly atop my (invisible) belly. 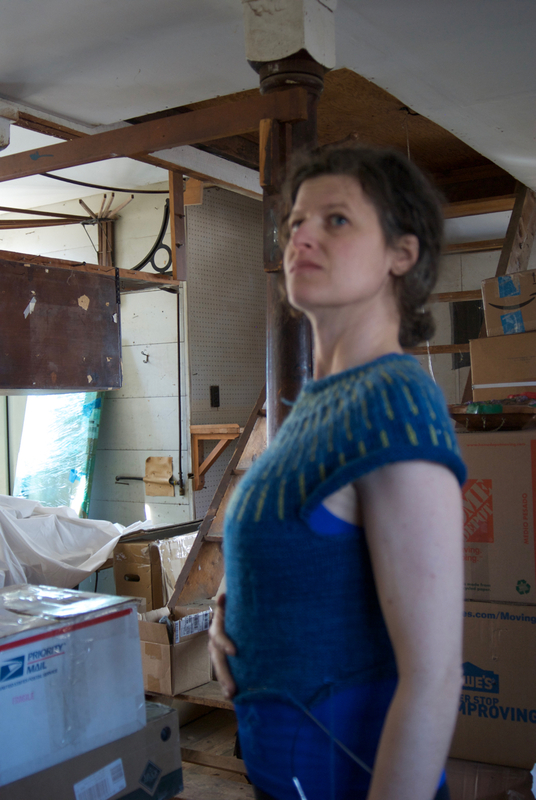 I am fairly sure the impetus for this photo session, aside from the desire to document the progress of my heavily modified Solbien cardigan turned dress, was the discovery that my vague feelings of becoming a little thick around the middle had solidified into an actual baby bump (which again, I cannot see in this photo, though I remember running downstairs to show Sam the moment I noticed it, who was equally excited). Also the Socialist Realist pose - I look like I’m about to do something epic for the glory of the fatherland. To be fair, this Alabama Chanin A-Line dress is somehow magically also minimizing my belly, or maybe I just feel like I should be a foot or two wider. Back to a semi-business related note: Any moment now (really, any moment now kiddo, but hopefully soon - I get that you are comfy in there, but you’ve had your full run and it’s time to come out and start exploring the world) we will be heading off to the Birth Center for a hopefully short stay. There may be some delay in shipping orders and responding to emails as we all adjust to our new life. Thank you for understanding.